We here at Super Heroes Central really think Spiderman rocks and we’d love to share some great facts about him with you guys. 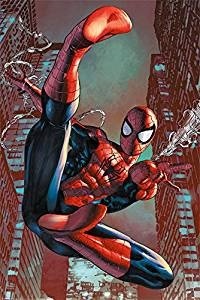 Spiderman first appeared in 1962 in Amazing Fantasy #15 and since then he has became a firm fan favorite, regularly winning fan based polls to see who is the most popular Marvel superhero, but just what are Spiderman’s powers and abilities? I mean we all know that he is a wise cracking crime fighter who started out when he was still a kid, but what can he really do? Obviously his superpowers are very impressive or they wouldn’t have made him a member of the legendary Avengers, a group of superheroes who have featured the likes of Iron Man, Captain America and Thor, it really is an elite team of Earth’s mightiest heroes. 1 How Did Spiderman Get His Powers? 2 What Are Spiderman’s Powers? How Did Spiderman Get His Powers? So how did Spiderman get his superpowers you ask? Excellent question, it all started when a young Peter Parker, an orphaned boy being raised by his Aunt May and Uncle Ben was a high school student on a class field trip to a public science exhibit where he was bitten by a radioactive spider. And Spiderman was born. That’s it you ask? Of course, because that’s what happens when you get bitten by a radioactive spider, you don’t get sick, require hospitalization and die. Nope your body mutates to take on the characteristics of a spider(and not the bad things like shooting gooey stuff from your rear end, nope only the good things). Oh yeah Peter accidently got his Uncle Ben killed by selfishly not stopping a robber who escaped and later killed his beloved Uncle(nothing like the death of loved ones and guilt to make you spend a lifetime fighting crime, eh Bruce). So after that Spiderman was truly born. So just what are Spiderman’s powers, well after being bitten by a radioactive spider Peter received quite a few unexpected and advantageous side effects, but as Peter’s late Uncle Ben told him, with great power comes great responsibility. So just what are Spiderman’s powers? Peter gained massively increased strength allowing him to lift several tonnes at least(approximately 11 tons seems to be the baseline), which is helpful when he is saving lives and fighting crime, in fact Spiderman’s strength is such that he has to take care and pull his punches when fighting bad guys who are not super enhanced so as not to badly injure them(he’s a way nicer guy than us). This strength mutation is do with the fact Spiders are proportionately stronger than people(apparently). Spiderman has reflexes and agility which are enhanced many times past the human norm, this allows him dodge gunfire fire from a distance(but not close range stuff), which combined with his incredible strength makes him a very formidable hand to hand combatant, surpassing the likes of Captain America. It also allows for incredibly advanced acrobatic heroics which aid him when trying to save lives or prevent disasters. He has an enhanced equilibrium(his sense of balance and direction and it also prevents vertigo and nausea from motion sickness and the like), this one is kind of specific to Spiderman and basically make a lot of sense when you think about it, if you are bitten by a radioactive spider and gained spiderlike powers, you’d get this one for sure because spiders are always hanging upside down and are all over the place(a lot of sense in the comic book world that is). This ability means that Spiderman is never disorientated no matter whatever position or circumstance he finds himself in. 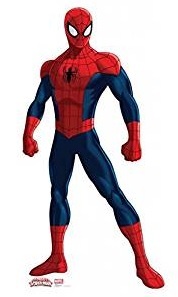 Spidey-sense, this is essentially a danger sense or minor precognitive ability(it allows him to sense impending events which will cause him harm) which combined with his highly developed agility and reflexes makes him a nearly impossible opponent to ambush, it’s also this ability that helps enable him to dodge bullets. It is also extremely useful when fighting multiple opponents at once it’s fair to say that this ability is one that has been instrumental in his success as a superhero and without it he wouldn’t be such a formidable opponent nor have been able to save as many lives as he has. Perhaps his most famous ability is that which allows him to climb and cling to nearly any surface(just like a spider really) the official rationale behind it is apparently that Spiderman is able to enhance the flux of inter-atomic attractive forces on surfaces he touches, increasing the coefficient of friction between that surface and himself(well obviously). The attraction is so intense that if a super strong bad guy is pulling him off a surface that Spiderman is clinging too, instead of being pulled off, the surface will in fact crumble around whatever he clinging to it(like feet and hands for example). This ability was initially concentrated in his feet and hands but has since evolved somewhat to the point that he can control his attraction over any part of his body such as carrying people on his back(upside down) or make his mask clinging to his face preventing an unwanted and accidental revelation of his secret identity(well that’s handy). It should noted that this ability will only work through a thin layer of material and that that if Peter wants to climb walls out costume he will first have to remove his shoes. While these abilities are some of the more prominent abilities gained by that radioactive spider bite, it should be mentioned that Peter’s overall human physique and physicality was enhanced to levels far surpassing the norm. His skin and bone density are far more resilient to damage and injury than those of a normal person(non super powered bad guys have been known to break their wrists when punching Spiderman) Also when he does get injured Spiderman heals at an extremely accelerated rate, with broken bones healing in hours. He just is better than the normal person in every way, with stronger ligaments, muscles and connective tissues aswell as an accelerated metabolism which allows to process and resists toxins that would kill the average person. Essentially that spider bite made him better in every way possible(because apparently spiders are a lot tougher than people). Why haven’t we mentioned his web slinging we hear you ask? We all know Spiderman uses webbing to travel great distances quickly, using his webs as ropes and swinging between the building, he also uses his webbing when fighting bad guys by entangling them, blinding them, disarming them and binding them(his webbings pretty useful stuff) he also uses to help him save lives by securing falling objects and debris(as well as falling people). So yes Spiderman’s webbing is integral part of his powers and abilities, but here’s the thing, it wasn’t caused by the spider bite. That’s right, that nasty radioactive spider was lucky enough to bite a scientific genius who used an advanced understanding of chemistry and engineering to create an advanced pair of mechanical web shooters which shoot a viscous fluid of his own design and has phenomenal strength, adhesion and durability that hardens with contact with the air and will eventually deteriorate over a prolonged period of time(otherwise there’d be cobwebs all over New York), this incredible stuff can be used to create long single strands or even complex web designs(like a spiders web) and remember Peter Parker did all this while he was still at school(really lucky break that one of smartest guys on the planet got bit and not some football jock I guess). So when we were researching this article we found a very cool clip on You Tube showcasing some of Spiderman’s abilities, so if you to know more about your favourite wall crawler have a look and enjoy. 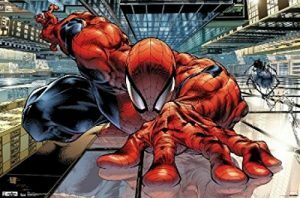 Well we hope you’ve loved reading about Spiderman as much as we love talking about him, he really is one the coolest super heroes in the Marvel universe, which why he always has great team ups with fan favourites like Wolverine, Deadpool and the Hulk, usually with hilarious results.